Nostalgia In Miniature Workshops: Rather A Lot To Catch Up On - Latest News!! Rather A Lot To Catch Up On - Latest News!! 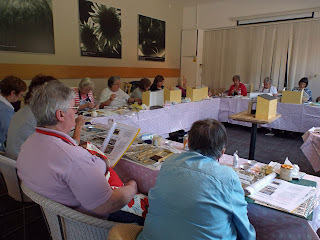 It has been quite some some time since we last posted on here, so we really must start by thanking all the ladies who came to our most recent workshop on Saturday September 19th. We do hope you enjoyed the day - we certainly did. Having run this same Little Vintage Toy Shop project twice already this year, we were able to make a few changes on this one which helped things run more smoothly and quickly. Below are a few photos of the day. to absolutely everyone who has contributed to that total over the year. Plans are now forging ahead with next year's main workshop project....and the Reserve List is ever growing. So if you haven't done so already but would like to register a possible interest in coming, please do get in touch with either of us asap. Places will be limited, but adding your name to the Reserve List now means that when booking officially opens in January you will be offered a priority place before booking goes live to the general public on the website. If everyone on the reserve list accepts their invitation for a place, then it looks very likely that we will be running the project for two sessions at the very least. The all day workshop project will be priced in a similar region as our 2015 project but unlike this year, next year's project will be offered in both 1/12th and 1/24th scale - so the smaller scale project will comparatively be a little cheaper. We have discussed again with the Bicester venue the possibility of confirming some dates for next year with them now, but unfortunately due to their strict booking restrictions we simply are unable to do so until January 2016. 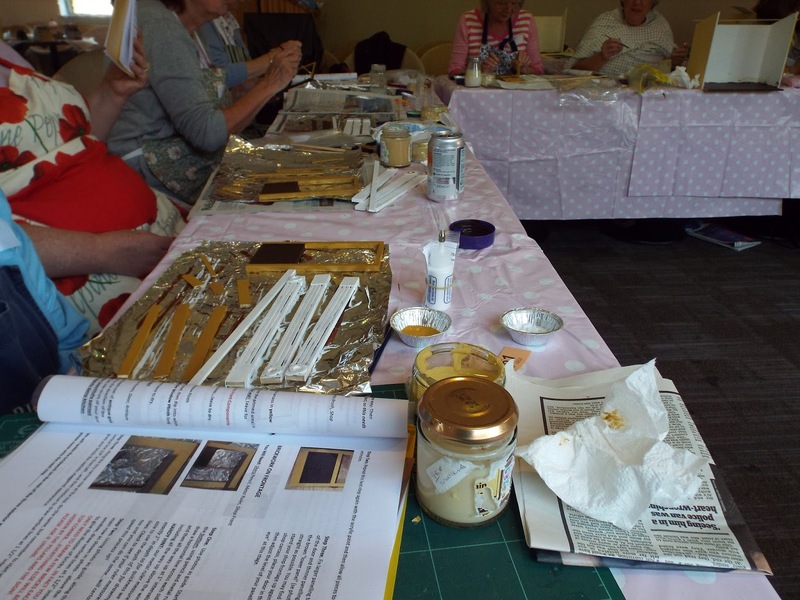 We will be aiming for at least one Saturday in June and then any subsequent workshop(s) will be a little later in the year. This project will be very much in the early 1900s German style with a distinct emphasis on a faded elegant pretty antique finish, the focus being on the interior only. At this stage we have no plans for contents but instead will mainly concentrate on the construction, furnishing and decor. It will consist of an MDF base, two side walls and back - exact measurements are still being debated. For those of you who are not familiar with the early 1900s German style shops.....try Googling "antique german miniature shop" and look at the "images" section, so that you will get a feel for the style we hope to be aiming for. Very different from this year's vintage shop project and for any antique and vintage dolls house enthusiasts out there, this may very well appeal to you (it certainly will be cheaper than purchasing the increasingly difficult to get hold of genuine "antique German miniature shop")! We have great plans to offer a variety of embellishments and elements, making it suitable for a whole wide range of uses and probably the most versatile project we have undertaken yet. Think...decorative mock background door - with either a mirror or antique lace, lots of versatile shelves, side dresser, glazed cupboard, opening drawers, ornate decorative pillars, antique style hanging lampshade, decorative counter and various optional design elements. We will bring you more details including one or two photos, as the prototypes take shape. Your shop could be made into whatever you want it to be....haberdashery, bridal, general stores, shoe shop, millinery, ironmonger...the list is endless. So, if this has tempted your tastebuds....please do get in touch asap to add your name to the Reserve List. Fundraising for Hearing Dogs For Deaf People & Thames Valley Air Ambulance. Both of us will be having a stand in our own right as KT Miniatures and Coombe Crafts at this delightful little event....but the new organisers have also allowed us to have a stand for our Nostalgia In Miniature Workshops too, which is rather nice. So we will displaying a few past projects plus possibly selling off one or two early project prototypes too...as we are seriously running out of space. To date, we have undertaken 12 workshop projects since we began, not to mention several commissioned projects for Dolls House & Miniature Scene Magazine!!! 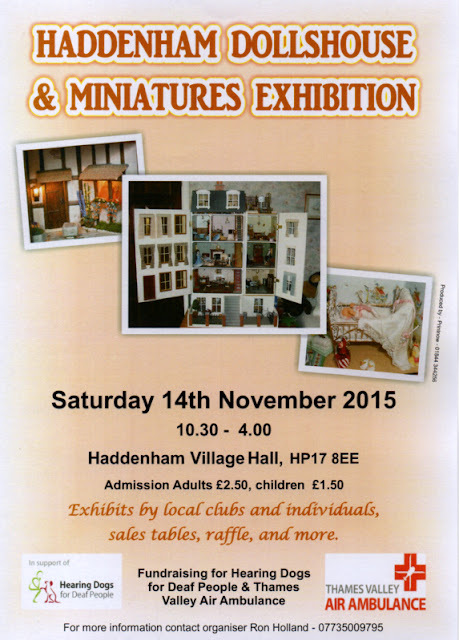 This Haddenham event has always been a biennual event up until now but the organisers of Thame Dolls House & Miniatures Fair have agreed to take this delightful event over from the previous organisers -Freda and George Dorrel - who after many years have decided to retire from fair organising. Haddenham is just less than 2 miles from Thame, close to Junctions 6 & 8 of the M40, has its own mainline station (Haddenham & Thame Parkway) with direct route from Birmingham Moor Street and London Marylebone. There is a permanent taxi rank at the station or if you are feeling energetic, it would probably take about 15 mins to walk from the station to the Village Hall (with the wind behind you)! Or there is a bus stop outside the station with a bus every 20 mins. into the village.